A scene from my nightmares will unfold in our nation’s capital on Wednesday: Kim Kardashian and Donald Trump will meet in the White House, thanks to “months” of back-channel talks between the princess of Calabasas and Jared Kushner. Sources told Vanity Fair that Kardashian will reportedly ask the president to pardon Alice Johnson, a 62-year-old woman who has been in prison for over 20 years, serving a life sentence for a first-time drug offense. 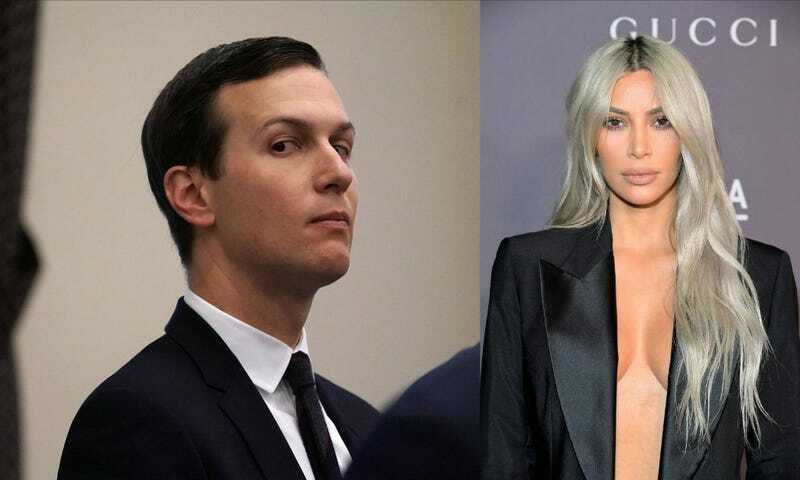 Kardashian reportedly heard about Johnson on Twitter and reached out to Ivanka Trump, who get Kardashian in touch with her hollow-eyed husband. The Trump administration, with Attorney General Jeff Sessions taking the lead, is rapidly unwinding years of criminal justice reform and resurrecting the drug war, but Trump has shown himself, predictably, to be open to high-profile acts of mercy that will generate good press. While progress on Johnson’s case is unquestionably a positive thing, it’s clear that Trump is considering it because the people making the appeal are famous. Kardashian’s plea, and Kushner’s push for reform, are at odds with the Trump administration’s own policies. In one of his first moves as attorney general, Jeff Sessions rescinded an Obama-era memo that increased leniency for low-level drug offenders, instructing federal prosecutors to bring punitive charges that could trigger precisely the sort of tough mandatory sentencing that condemned Johnson to life without parole. Trump and Kardashian will meet in the Oval Office alone—her husband, Kanye West, her sisters, and the Keeping Up With the Kardashians camera crew will not join her this time around. Instead, Kim Kardashian will appeal to the president about prison reform alone and likely, she will get what she wants. In Trump’s America, a person wrongfully imprisoned can be granted release, if they happen to find themselves with a celebrity advocate. Jezebel Investigates: Is This a Finger, a Bicep, or Jared Kushner&apos;s Cursed Pec?